So, imagine you are a publisher. You are in the quaint position of trying to sell hunks of paper pulp and ink in a LOLcat world. Embattled doesn’t even being to cover it. You may even start to suspect that the world is descending into a slough of idiocracy from which it may never emerge. Then, someone comes to you with a proposal to write a full color graphic novel that traces the life of Bertrand Russell as he grapples with the establishment of the logical foundation of mathematics, trying to set them on the firm ground they deserve, proving that 1 plus 1 equals 2 with over 100 pages of abstruse formulas. Of course, you say yes. 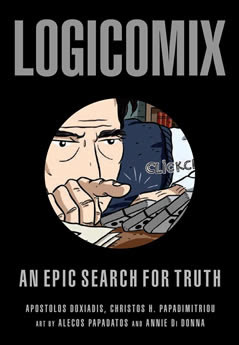 Logicomix is an impressive and painstaking examination of the 20th century philosopher’s quest to give mathematics something which many observers didn’t know it needed: a place to stand. The writers use a double frame. First, we see Russell giving a talk as the US finds itself on the brink of World War II. Second, we see the writers (including a hirsute computer scientist) and artists ponder the best way to demonstrate Russell’s life and work. In the talk, Russell uses the occasion of a public lecture entitled “The Role of Logic in Human Affairs” to go in painful detail about his childhood and the writing of Principia Mathematica (the audience might need to order out for pizza if they expect to make it to the end). As you might guess, the descriptions of his brushes with madness and marital disharmony are easier to establish than his disquisitions on logic. When reading these, the text does seem to descend into one of those Logic for Dummies books where Russell dreams of Gauss excoriating him for Wrecking the Foundation of Infinity! I’m not sure I’m smart enough to understand why. Interspersed with the narrative, the producers of this book wander around Athens and debate with each other about the best way to shape this story into something comprehensible. Initially, I thought this would be extremely annoying, but there is something undeniably charming about the earnest, thoughtful nature of their talk. They believe in this project. The story is meaningful and profound in a way that is rare, not only in the world of graphic novels, but also in the world of culture in general. The writers give us the great compliment of honoring our intelligence and willingness to follow their story to its ultimate ends. And it should be said that the ends are mixed. The payoff after the extended narratives of mathematical proofs and tight logic are not what we might hope for, though the decision to end the novel with a depiction of Aeschylus’s Orestia is surprising but powerful. The suffering of the furies at the thought of their proper vengeance thwarted provides a strange opposition to Russell’s hyperlogical quest. This book is not for wussies, but it does have the potential to wake in students who have a mathematical or scientific bent an overwhelming desire to undertake an intellectual quest. I could see an AP Calculus class or even an AP Language and Composition class using this as a supplemental text, following Russell’s pursuit with heavy helpings of teacherly guidance. It’s rare that schools and education recognize that the search for knowledge need not be a dreary endeavor but can instead be true and heroic. Highly Recommended for upper level high school or college students interested in mathematics or philosophy.